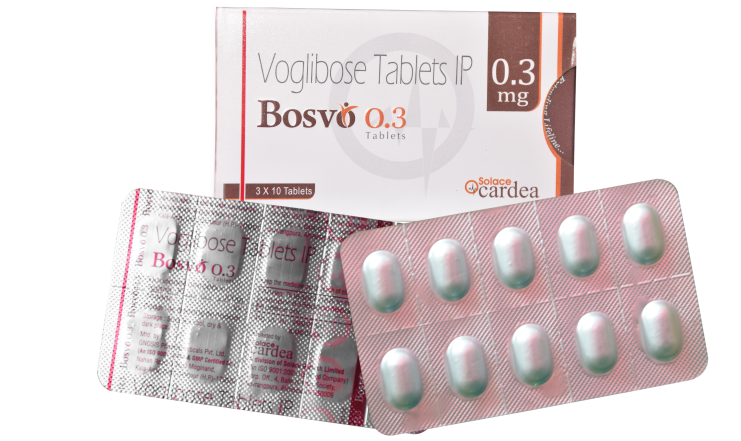 Bosvo 0.3 mg tablets contains Voglibose. It belongs to the category of alpha-glucosidase inhibitor which mainly useful in management of post- prandial blood glucose in diabetic patients. It helps in delaying the absorption of glucose. The drug is initiated at lower doses in elderly patients. 200-300 mcg trice daily before meals. Voglibose is an alpha amylase glucosidase inhibitor which produces its action by inhibiting the alpha glucosidase present in the intestinal wall which causes reduced absorption of disaccharides, dextrin and starch in the intestine. This helps in reduction of rise in post prandial glucose. All the actions produces by the drug are not involving stimulation of insulin so it reduces the risk of hypoglycemia in patients. The majority of the drug is present in the gastro intestinal tract where with the presence of glucosidase inhibitors attains its pharmacological actions. The drug is metabolized mainly by intestinal enzymes. The maximum amount of drug is excreted in urine and feces.